The Children’s Eco Programs offer fun, environmentally focused day camp programming! We incorporate art, science, nature, organic gardening, vegetarian cooking, drama, storytelling, music and movement into adventure filled days in High Park. Traditional camp activities such as swimming, crafts, hiking and offsite trips are also important parts of the program. Our Eco Camps are OCA Accredited, click here to learn more! Please register through the City of Toronto online FUN Guide site, telephone or specific recreation centres starting Wednesday, March 6th, 2019 at 7 a.m. We suggest starting right at 7 as space is limited! Before and after care (8 am – 9 am and 4 pm to 5pm) is available for all camps but you must pre-register your camper(s). Camp runs from 9 am – 4 pm Monday to Friday unless otherwise noted for Holidays. Click here for information on how to register for Eco Camp programs with the City of Toronto. A quick note about our weekly themes … there are a number of regular camp activities that happen each week such as swimming, hiking, gardening, games, crafts and cooking. The weekly theme is there to give us a chance to focus these activities on certain aspects of High Park, the Children’s Garden or our Teaching Kitchen. So for example Critters and Crawlies will focus on the insects and animals you can find throughout High Park and in the Children’s Garden. Veggies and Ventures concentrates on gardening and cooking the veggies we grow. Description: Start your camper’s relationship with food, nature and organic gardening off right with a week of Eco Sprouts Eco Camp! 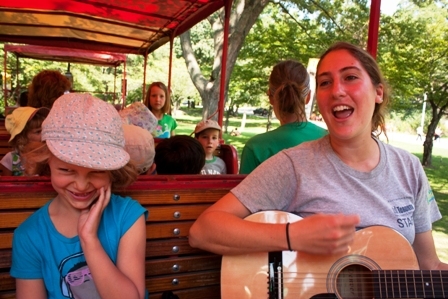 High Park is a natural urban oasis and the perfect setting for your young camper to learn, grow and have fun. Hiking, organic gardening, games, crafts and bug hunts are just a few of the things your little sprout will do during a week of Eco Camp. Description: This is an active fun-filled camp for kids that love the outdoors. Organic gardening, nature exploration, hiking, offsite trips and more await your junior camper. Regular camp activities like swimming, crafts and games are also a great part of the program. With themes like Nature Arts, Super Senses and Beyond Bugs your camper’s sure to learn, have fun and remember their fantastic camp adventure for years to come! Description: For our Youth campers we focus on expanding their relationship with nature, food and community. Fun is also a big part of the program! An extra offsite trip to a youth run organic garden, a day of practising outdoor survival skills or an opportunity to be creative and make a piece of art for the garden help our Youth campers connect with the world around them. Cost for all one week camp programs is $274.00 ($218.00 for the 4 day weeks July 3-6 and Aug. 7-10, 2018). Extended care costs $20.00 per week (16.00 per 4 day week) for am care from 8 to 9 am and $20.00 per week ($16.00 a week per 4 day week) for pm care from 4 to 5 pm. For more information about registering for City of Toronto Recreation Programs call 416-338-4FUN Toronto or check out Toronto’s FUN Guide online. You can find the High Park Eco Camps in the Toronto/East York and West Toronto/York FUN Guide. **NOTE** This is different from our previous listing in the Etobicoke/York FUN Guide. OK…I am real confused…I SEE the Music Garden still mentioned here and there on your website, but are there no longer Eco Camps running at The Music Garden on the waterfront, and can I still sign up through Parks & Rec…? Are there any spots left in camps for 6 years olds this summer. Our two younger camps are full but you can always add your camper’s name to our wait lists. You never know when a space might come up. Check our Eco Camp page: https://childrensecoprograms.ca/programs/eco-camp/ for dates and barcodes then you can sign up for the wait list on the City of Toronto’s Fun Guide Online Registration Page: https://efun.toronto.ca/torontofun/Activities/ActivitiesAdvSearch.asp. We also host a free family drop-in program on Thursday mornings in July and August from 10 to noon. Lots of fun activities to be had there too 🙂 Plus our Birthday Bash is this weekend on Sunday from Noon to 4 pm. Lots of fun, free activities and a free harvest lunch! There’s always something to do at the Children’s Garden! Hi there, I am interested in becoming a camp counsellor or assistant for the Eco camps next summer–could you please give me some information about this process? Thanks so much! Hi, thanks for your interest and good question! Your timing is perfect. Check out The City of Toronto’s Website for summer job posting and how to apply: http://www1.toronto.ca/wps/portal/contentonly?vgnextoid=4e58dada600f0410VgnVCM10000071d60f89RCRD Deadline to apply is Feb. 3, 2014. I see that the themes in the website above differ from those that are in the handy chart that you prepare with the registration codes. Can you please confirm which week is which for the Junior group? Is there a program with space for my 4yo and 7yo the week of July 21-25?